W ith a move from London to California came a whole new calendar of holidays. One of those is today ‘Cinco De Mayo‘ – ‘5th of May’ in Spanish. Now you don’t actually get the day off but they make a bit of a song and dance about it…literally. In the US Cinco De Mayo is a celebration of Mexican culture and heritage though the day actually commemorates the Mexican army’s victory over French forces at the Battle of Puebla on May 5, 1862. Right, that’s the history lesson over for the day (phew!) though you can read more about it here if you’re feeling particularly studious. Anyway, as with most holidays, I usually get most excited by their inevitable relationship to food. So when He told me they were having a bbq at work to celebrate and that everyone had to bring something I felt that was my cue to get on Pinterest… . I wanted to avoid anything high profile as I’ve come to realise that people are quite particular about their Mexican food here and didn’t want to cause Him any unnecessary embarrassment by getting it wrong, so I thought I’d try my hand at something sweet. I’ve made these Mexican Hot Chocolate Cupcakes before but I needed to make something that would stand up to the sunshine. 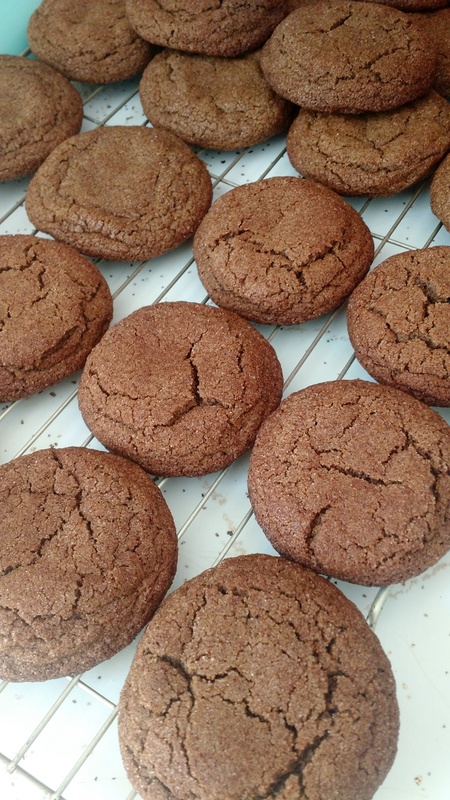 That’s when I hit upon a recipe for Mexican Hot Chocolate Cookies – genius! Granted, they are by the very un-Mexican Martha Stewart (with a few of my own tweaks) but they are very addictive and pretty easy, considering my aversion to baking. For those of you that are interested here’s a link to the recipe I used and below are the things I did slightly differently. I used 1 cup of white sugar and 1/2 a cup of soft brown sugar in the cookie dough mixture. Double roll the cookie dough to give a bit of an extra kick. If you like the idea of a little more spice, sprinkle the remaining sugar and spice mix over the top of the baked cookies, once they’ve cooled. For those that don’t measure in cups this article with conversions from cups to grams is pretty handy.